PRESS RELEASE: GuitarGuitar, the UK's largest guitar store, are proud to announce the opening of their new flagship store in Epsom, Surrey. 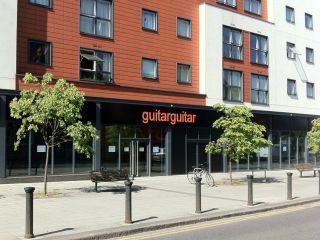 Opening Saturday 18 June 2011, with over 8000 square feet of floor space, GuitarGuitar London will offer a retail experience like no other. Situated on Church Street, in the heart of Epsom, GuitarGuitar will provide the South West and London areas with an unparalleled selection of guitars, amplifiers and effects. With stores in Birmingham, Edinburgh, Glasgow and Newcastle, GuitarGuitar are renowned for their huge selection of brands, from the perfect starter guitar to that dream boutique masterpiece. Epsom will be no exception, offering the biggest names in electric guitars such as - Fender, Gibson, Epiphone, PRS, Ibanez, ESP, Schecter and Rickenbacker; as well as exclusive lines like Tyler, Suhr and LSL. With a dedicated acoustic guitar room, players will be able try everything from Gibson, Martin, Taylor and Collings to pieces from the UK's leading luthiers, such as Moon, Lowden, Atkin and Patrick James Eggle. Bass players won't be disappointed either, with Epsom set to offer the biggest and best names in bass. Fender, Squier, Ibanez, Yamaha and Epiphone join boutique brands like Sadowsky, Lakland, Rickenbacker and Fender Custom Shop. If all those guitars weren't enough, Epsom will serve as a supercentre for the hottest names in guitar and bass amplification, Marshall, Orange, Bogner, Egnater, Aguilar, Vox, Line 6, Roland, TC Electronic, Phil Jones, the list goes on! The store will also offer a guitar pedal cornucopia , stocking Boss, Electro Harmonix, ZVEX, MXR, TC Helicon, Red Witch and Strymon, to name a few. GuitarGuitar will even host an in-house guitar technician, providing a full repair service as well as offering customers the ability to have their guitar set up by a PLEK machine. Just like their Glasgow store, GuitarGuitar London will contain a Roland planet, an innovative way to experience the most exciting hi-tech instruments available. All plugged in and ready to play, the Planet will host the full range of Roland digital drum kits, synthesizers and music production hardware. As part of the Planet experience, a Roland product specialist will be on hand in Epsom to offer customers full product demonstrations, as well as host clinics, workshops and training days. Epsom is just 30 minutes from London Waterloo station and to help cover the cost of your journey, GuitarGuitar will be giving a free set of strings to everyone who walks through their doors on the opening weekend (18 - 19 June). Information taken from official press release, for more visit GuitarGuitar.